Welcome to the PowerDVD 12 review. With PowerDVD now the dominant Blu-ray/multimedia player on the PC platform, and with this being (at least) the 12th iteration, it's getting to the point, if we haven't reached it already, where improvements either have to be revolutionary (ie. very different), or extremely subtle and incremental - there's just not a lot of areas that need obvious improvement. With the 3D hype dying out, and Smart TVs and Blu-ray players now doing a lot of things that PowerDVD can do (without the need for a dedicated home theatre computer), the pressure is on for Cyberlink to delivery just the right amount of "new". Read on the find out if they've done it, or if this is one upgrade you might think about skipping. You can read the archived review of PowerDVD 11 and almost all previous versions of PowerDVD all the way to version 2.5 in the article titled: PowerDVD Review Archive - visit this archived review page for a hit of nostalgia! This page tries to list all the significant new features of PowerDVD 12 (as compared to PowerDVD 11) - if you want to see a complete review of the latest version of PowerDVD, please refer to the next page. That's an impressive list of changes, at first glance, so let's go through the main new features one by one. The last two versions of PowerDVD added the ability to convert 2D videos and even pictures into 3D, and PowerDVD 12 takes this one step further and adds support for Blu-ray 3D upconversion. This means that you can put any standard, 2D Blu-ray movie into PowerDVD, and PowerDVD 12 (Pro and Ultra) will convert it to 3D for you. Also new in 12 is the support for the MK3D format (again, also only for Pro and Ultra versions). MK3D is a semi-unofficial format for incorporating 3D videos in the popular MKV container. And PowerDVD 12 now supports native YouTube 3D video, as well as the 2D to 3D conversion feature that was present in previous versions. Syncing your media between PowerDVD and your Android/Blackberry devices has been improved with Smart Sync, with automatic sync possible via smart rules (sync or don't sync based on user configurable rules such as playlist/rating/imported time). Also new is the automatic video transcoding tool, ensuring the video that you do sync to your smart device will actually play on that device by transcoding the video to a format that is supported. 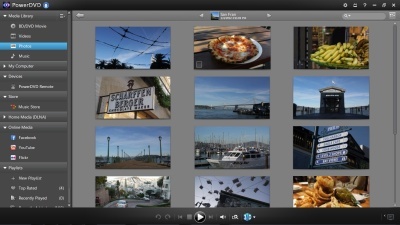 Included for free with the Ultra version of PowerDVD 12 is PowerDVD Mobile, which is now also available for iOS. PowerDVD Mobile integrates with PowerDVD 12 to allow you to browse, stream or download media from your desktop PowerDVD to your mobile device. PowerDVD 12 Ultra is now a certified DLNA Digital Media Controller (DMC) and Digital Media Renderer (DMR). 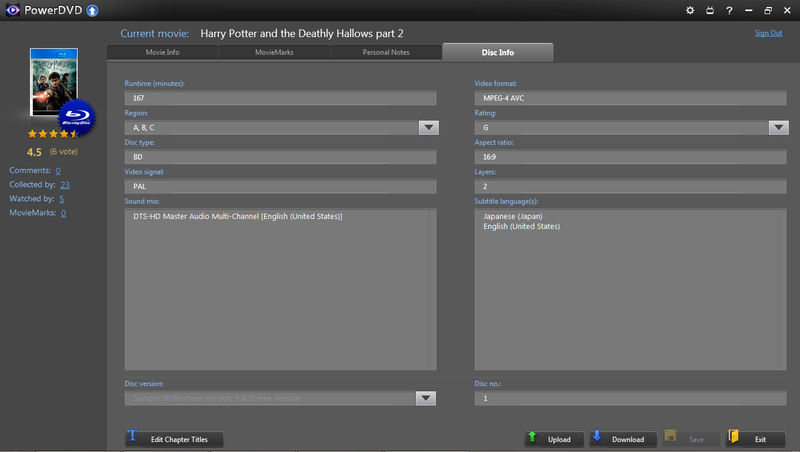 DMC allows PowerDVD to find media stores on other DLNA servers and play them to other DMR devices. 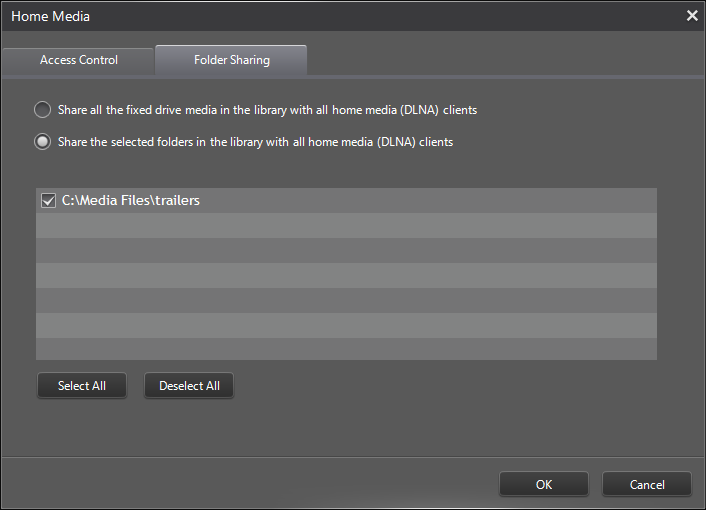 This means you can now use PowerDVD or organize your media library and then share this media with your DLNA compatible devices, such as the PS3, in addition to doing the opposite (allowing PowerDVD to view content stored on your DLNA server). DTS-HD 7.1 is now fully supported in PowerDVD Ultra (5.1 supported in Pro), and lossless audio support has been added for the OGG/FLAC audio formats. Instant Seek has been added for Blu-ray playback, meaning you can skip to any scene in the movie almost instantly via dragging the navigational slider. Instant View presents thumbnails for every picture and video files in a single folder without having to first open any of the media files. Instant Zoom, not available for Blu-ray, allows you to zoom into the video seamlessly by dragging a slider on the main navigational panel. And finally, Instant Scale allows you to adjust the size of the thumbnails to suit your screen size. 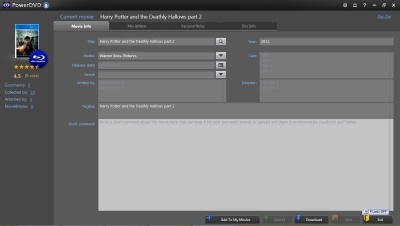 PowerDVD 12's interface has been further streamlined, with everything now accessible from the left hand side navigational tree, and closer integration of online components. Installation and setup was painless. You can install this new version on top of the previous PowerDVD versions, meaning you can theoretically have 8, 9, 11 and 12 all installed at the same time, but you can only run one at any one time (and it's still very much recommended to only have one version installed at a time, due to incompatibility problems that may arise). This behaviour hasn't changed since the previous version. The "User Interface" section has been replaced with the "General" section, with a couple of new options added. In addition to the software language selection option, there's also now the ability to "name" your install of PowerDVD, which will be used as part of the DLNA server name/smart devices connect name. The new feature of automatic video transcoding also gets a new option here, with the number of concurrent file conversions. 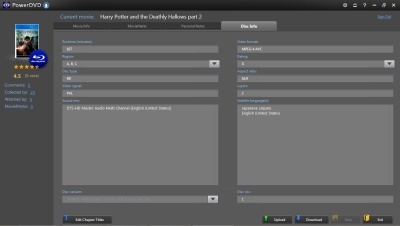 A new "Library" configuration section has been added, and the options here allow you to set folders that PowerDVD will "watch" for new media, media that will then be viewable from the main PowerDVD interface, shared via PowerDVD's DLNA server and smart device sync features. 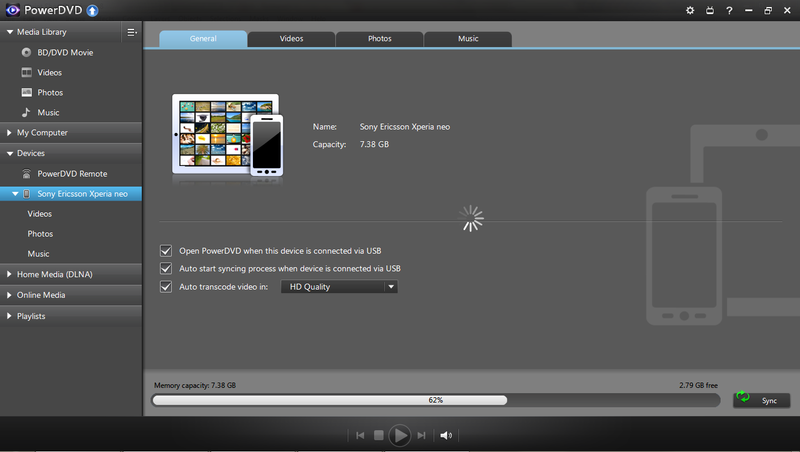 You can also tell PowerDVD to ignore certain files, such as files over and under a certain size. The options on the "Player" tab are almost exactly as they were in the previous version, and are pretty self-explanatory. 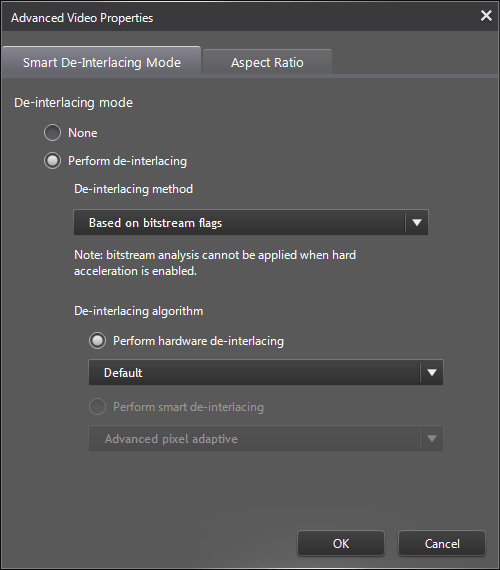 A new "Display OSD" option has been added here. More options are hidden under the "Advanced" button. 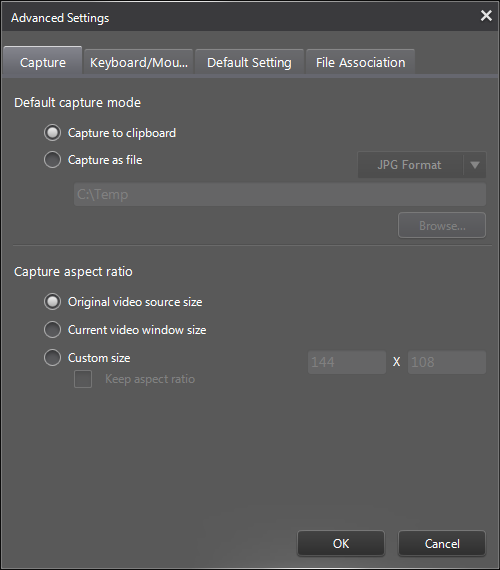 The "Capture" sections gains back some of the missing options in the first release version of PowerDVD 11, so it's nice to see options like custom resolutions coming back. There has been a major re-organisation of some of the options here. 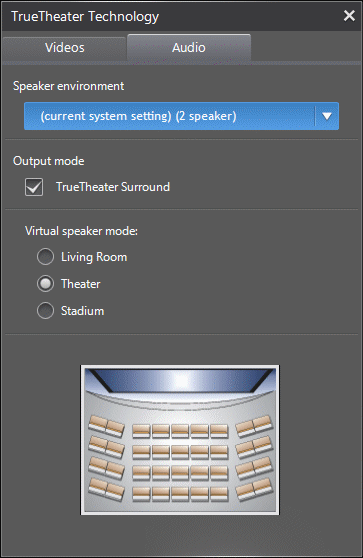 The TrueTheater related options have been moved to a separate openable window (and combined with the TrueTheater audio options, previously in the "Audio" section). The "Advanced" section also sees changes, with the previous separate "Aspect Ratio" section moved to here as a sub-section. 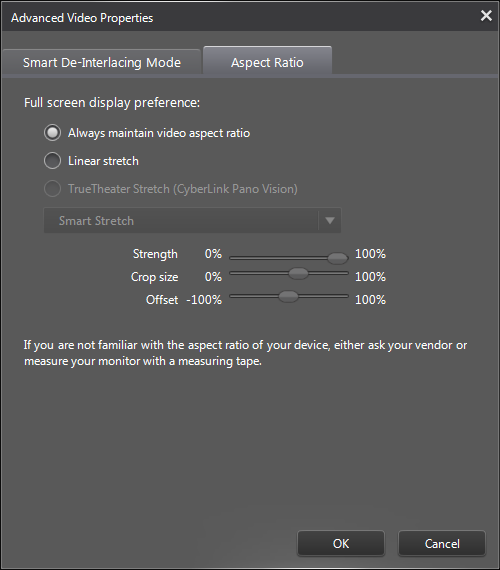 The aspect ratio section is where the TrueTheater Stretch option can now be found, and you can also configure the output monitor/TV type here. PowerDVD supports TrueTheater enhancements for all types of videos, even YouTube and streamed videos from DLNA or smart devices. 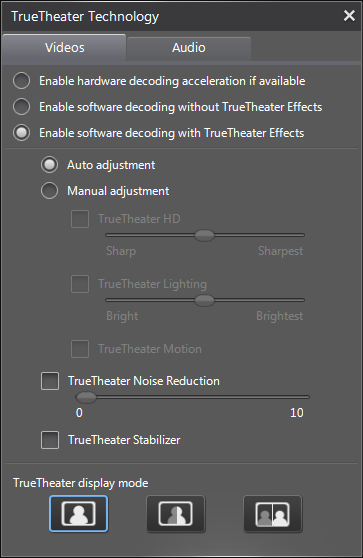 The only slightly confusing part is the "audio" section of TrueTheater, now that audio options have somehow found itself into the sub-section of the "Video" section (and most of the options have to be duplicated here and in the "Audio" section, to avoid confusion). The actual options remain largely unchanged from previous versions. 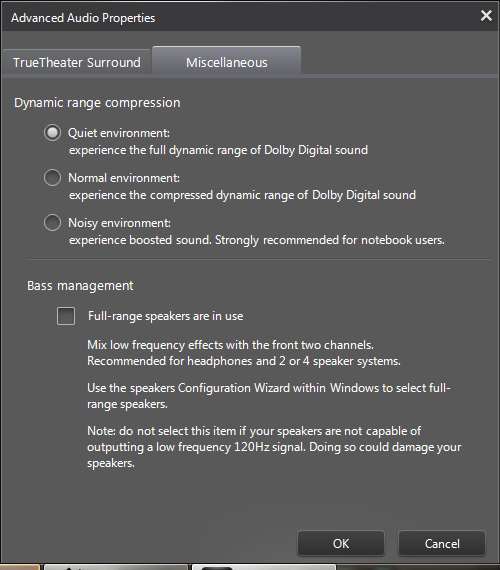 The "Audio" tab allows you to change the speaker settings and output effects mode (TrueTheater Surround, formerly CLMEI, Dolby Pro-Logic IIx and DTS Neo:6). To configure the output effects settings, you can click on the "Advanced" button - but as mentioned before, most of the options here have already been duplicated in the Video -> TrueTheater -> Audio section. 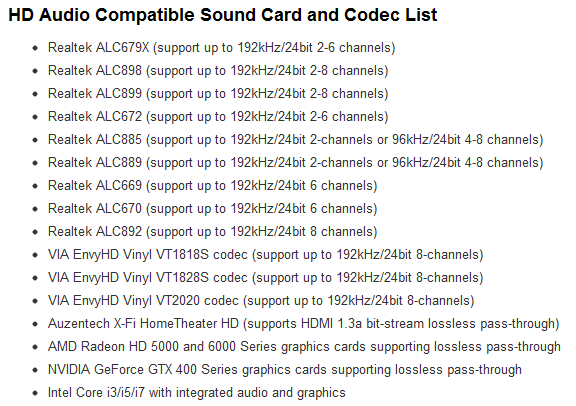 PowerDVD supports HD audio, with about a dozen different chipsets/cards being supported (notably Realtek ALC885/889/669/670/892, VIA EnvyHD Vinyl VT1818S/VT1828S/VT2020, Auzentech X-Fi HomeTheater HD, NVIDIA GTX 400 Series, ATI Radeon HD 5000 and Intel Core i3/i5/i7 with integrated audio and graphics - see screen capture above from Cyberlink website - note that this list may not have been updated yet for PowerDVD 11). 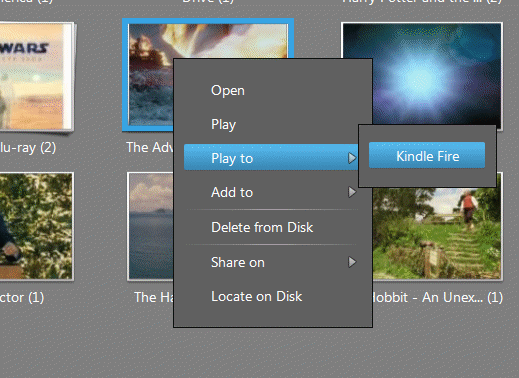 The "DVD" tab controls the DVD options, such as Read-It-Clearly mode and smoother DVD/VCD playback at high speed. 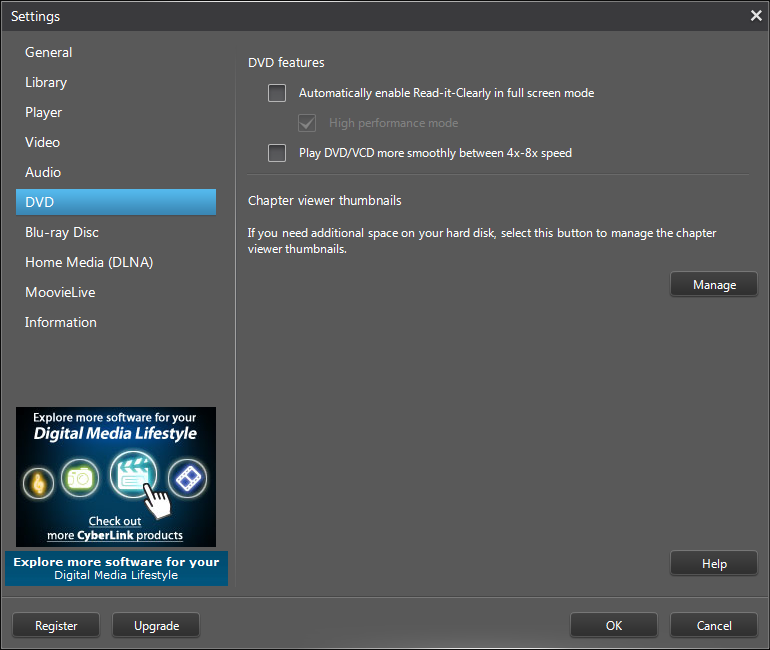 Here, you can manage the chapter thumbnails created by PowerDVD's "FancyView" chapter viewing mode. Again, this section has remained unchanged since PowerDVD 10. 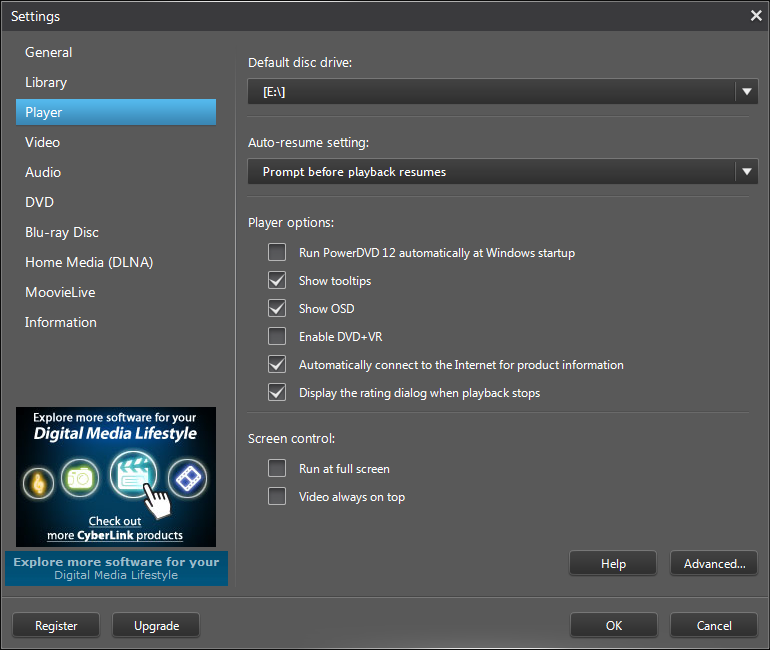 Again, things largely stay the same with the Blu-ray settings for owners of the Ultra edition of PowerDVD 12. 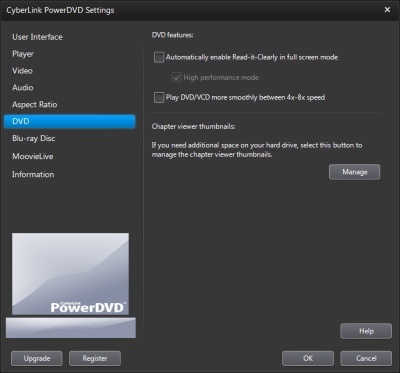 Here, you can configure locale information, including the Blu-ray region setting of PowerDVD. There might be a way to by-pass the region protection if your Blu-ray drive is not hardware locked, and you can read our Blu-ray Region-Free Guide for more information. You can also change BD-J keyboard support settings. Going into the advanced section, here you can change the persistent storage file location (persistent storage are things like bookmarks, downloads when PowerDVD is updated with BD-Live compatibility). 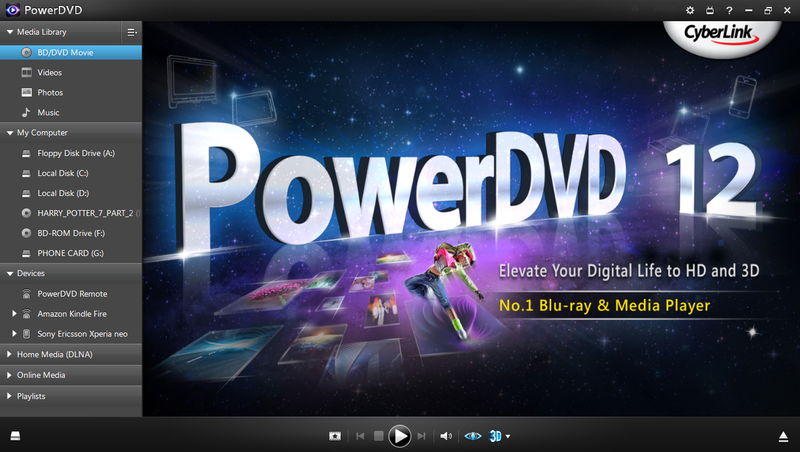 New to PowerDVD 10 was a "hybrid" disc option, familiar to those that used PowerDVD 7 for HD DVD. Hybrid discs contain both the DVD and Blu-ray versions of the movie on one side, and here you can specify which version plays for such discs. There's an option for Windows Vista/7 users to automatically enable/disabled Aero (some modes automatically force the disable of Aero, regardless of this setting). 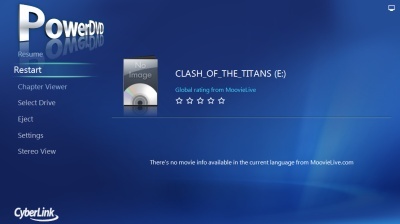 When the PowerDVD 10 review was first out, Blu-ray 3D support was still unavailable, but it is now standard with the Ultra version of PowerDVD, and so there's a Blu-ray 3D tab with one single option to enable or disable 3D (disabling 3D would then play 3D movies in 2D mode). New to PowerDVD 12 is the "Home Media (DLNA)" section, which configures PowerDVD 12's new ability to act as a media (DLNA) server to share your media library with your other DLNA compatible devices, such as your PS3 or your Smart TV. 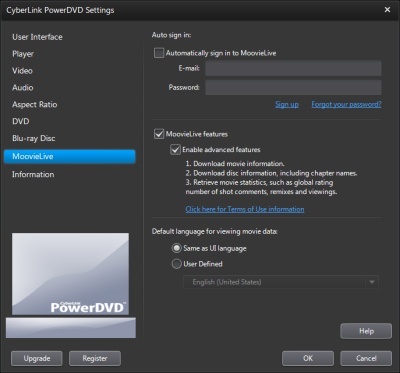 PowerDVD even supports a function that allows other media players to control PowerDVD, and an option is here to enable or disable this. In the "Advanced" section, there are additional options to control sharing options, and also to set which folders to share. So now onto the review proper. Instead of going through the same grounds as covered with reviews of previous versions of PowerDVD, instead, the review will now focus more on the changes. 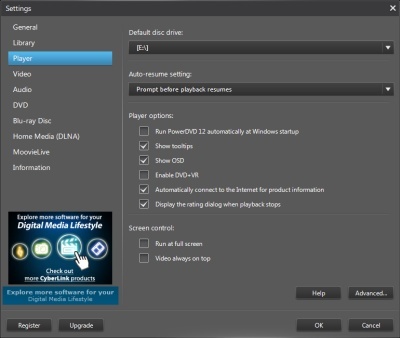 DVD and Blu-ray playback largely remains unchanged from previous versions of PowerDVD, neither in terms of quality, or performance. Any modern PC should be more than capable of playing back DVDs and Blu-rays, especially those with GPUs that provide hardware assisted decoding (which is pretty much all GPUs released in the last two years). 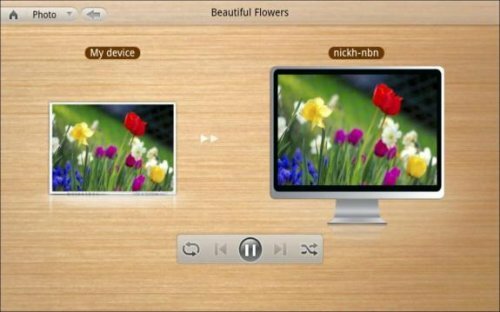 Feature wise, PowerDVD competes capably with the best hardware players, with full support for BD-J, BD Live, and decoding of most of the common high bitrate audio formats. 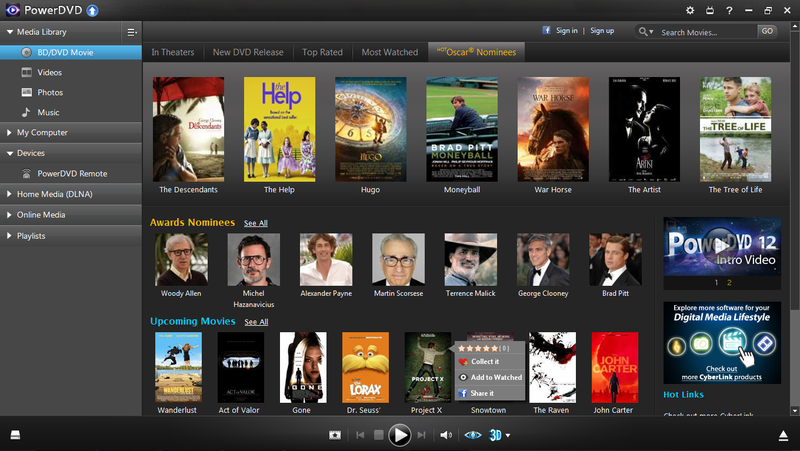 DVDs, like most video files, can also be upscaled to HD via enabling TrueTheaterHD. New for both DVD and Blu-ray playback in PowerDVD 12 is "instant seek", which does just as the name suggest. It can be best demonstrated by dragging the navigational marker, and even for Blu-ray movies, the seeking is fast and smooth. The practical uses for this feature, however, is debatable. 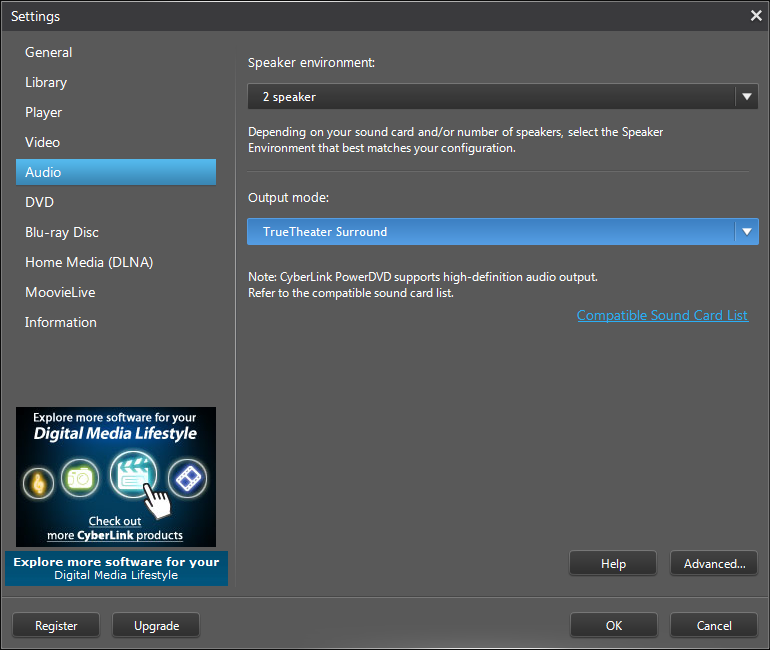 Also new for Blu-ray is DTS-HD 7.1 decoding. PowerDVD previously required you to output the bitstream to a compatible DTS-HD decoder/receiver, but it now supports decoding within the player itself, and so all you need to do is to set the speaker setting to 8 channels, and PowerDVD will do the rest (bitstream output, of course, is still supported). Only the Ultra version of PowerDVD supports DTS-HD 7.1 decoding, the renamed Pro version (previously "Deluxe" version) only supports 5.1 decoding. 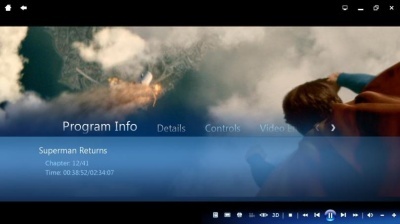 Also new is "instant zoom", but only available for video, DVD and Blu-ray playback. A slider bar is added to the main playback controls allowing you to use the slider to quickly zoom in and out of the picture. Not quite sure about the actual usefulness of the zooming, let alone an "instant" version of it, and it might have been more useful on Blu-rays to zoom into the fine details available. 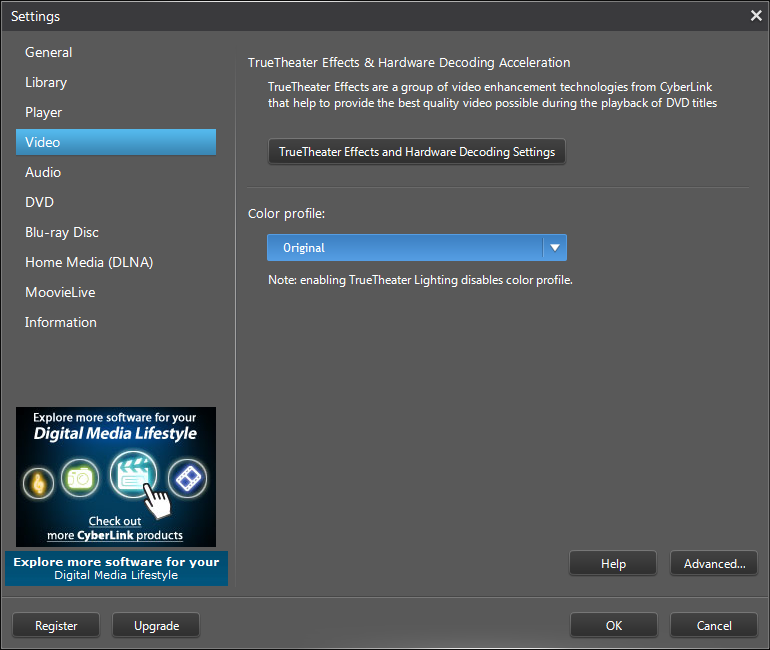 What is available for Blu-ray is TrueTheater 3D, previously restricted to video files and DVDs. 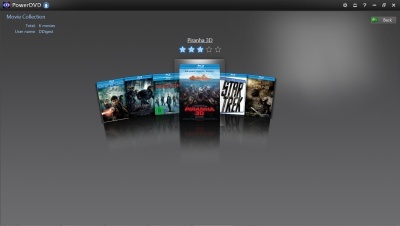 This feature automatically converts 2D Blu-ray movies to 3D, adding depth based 3D, if not exactly pop. Performance wise, enabling TrueTheater 3D increased CPU usage on the review rig from around under 20% to over 40%. A restart of the player is also needed to enable TrueTheater 3D for Blu-rays if it hasn't already been enabled in the current session. 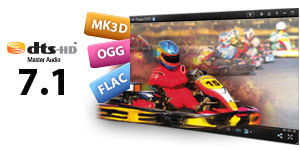 For file playback supports, the MK3D format is added - this is basically a MKV file containing a 3D video stream, and the support for it is a welcomed addition to PowerDVD. All the other major features remain largely unchanged, including the ability to play DVD movies from the hard-drive, capture screenshots from DVDs (but not Blu-rays), and TrueTheater Motion for video and DVD playback, which aims to remove telecine judder for 24 FPS content by playing the movie at a multiple of the 24, in this case, at 72Hz. While it would be really useful, TrueTheater Motion (and all the other TrueTheater) modes are not available for Blu-ray. PowerDVD 12 seems to perform just as admirably as previous versions, and that's probably expected, given the maturity of the software. For Blu-ray, disc start-up times were fairly quick, taking less than 10 seconds in most cases, and discs played previously seem to load a lot quicker subsequently. Playback performance was solid, and that's what you would expect given the CPU and GPU combo used in this review. Support for video acceleration from most of the major platforms (Nvidia, ATI, Intel) also helps greatly towards lowering CPU usage. Actual CPU usage was quite low, often hovering between 5% and 15% for Blu-ray playback, slightly higher depending on your audio decoding options. 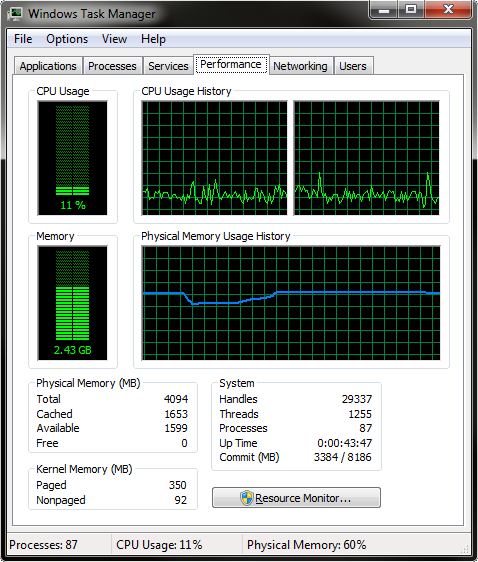 The screenshot of Task Manager below shows the typical CPU usage during Blu-ray playback at 1920x1080, with the new DTS-HD 7.1 decoding option turned on. So while video, DVD and Blu-ray performance hasn't really been improved, it didn't really need much improvement to begin with. As for the general performance of the interface, it did feel sluggish at times, especially during the loading/unloading of discs. For example, loading up the Settings section and selecting the various options lead to slowdowns, even when nothing was playing. I expect these "teething" problems to be fixed in upcoming patches. PowerDVD 12 Ultra finally adds support for DTS-HD 7.1 decoding (with the Pro version supporting 5.1 channel decoding only) - this means that PowerDVD now supports pretty much all of the Blu-ray audio formats. 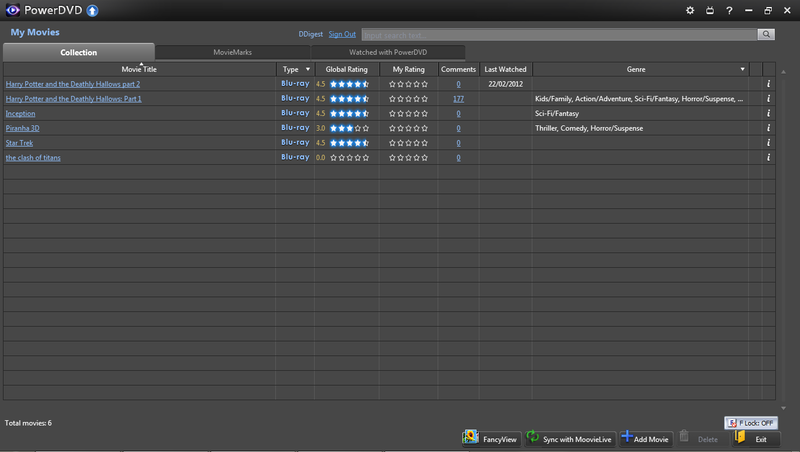 Also new in 12 is the addition of lossless HD audio support via OGG/FLAC. 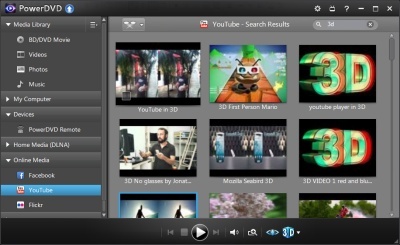 The major new feature of PowerDVD 11 was integrated YouTube playback, and PowerDVD 12 improves upon this by adding more functionality to the built-in YouTube client. 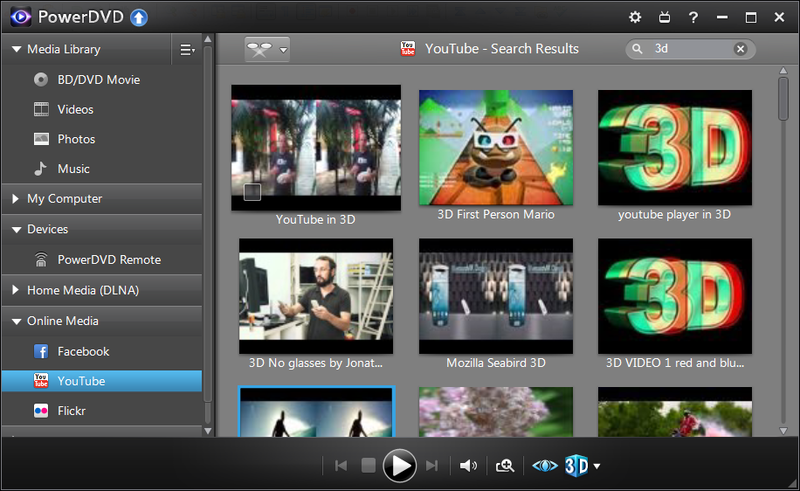 Native YouTube 3D content is now supported (in Pro and Ultra versions of PowerDVD), allowing you to view these videos in any of the 3D output methods PowerDVD supports. 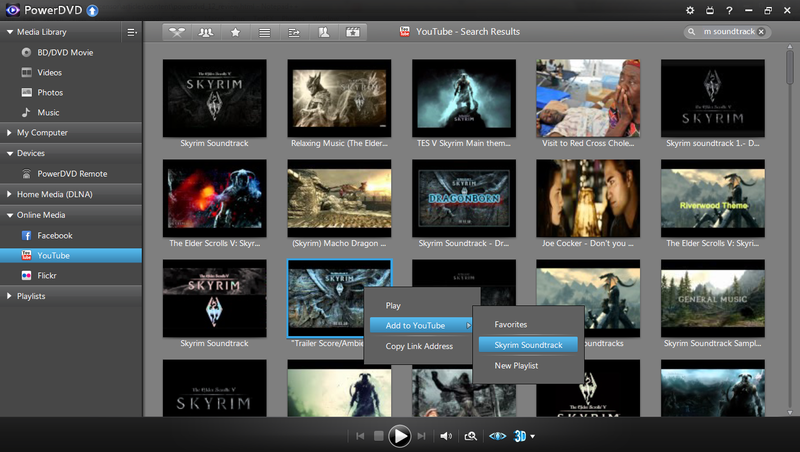 You can also now create playlists and add videos to existing playlists through the PowerDVD interface, which makes it a much more complete YouTube experience. Videos are played in the highest resolution available automatically, up to 1080p (despite YouTube now supporting higher resolutions). 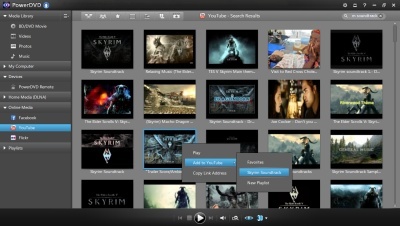 YouTube videos, like normal videos, will have access to the TrueTheater enhancements. YouTube uploads are still supported, which allows you to upload most playable video files, including 3D videos, within PowerDVD to YouTube (some files are not supported, and YouTube limits the length of videos anyway), PowerDVD will first convert it to a format that's compatible for upload if necessary. 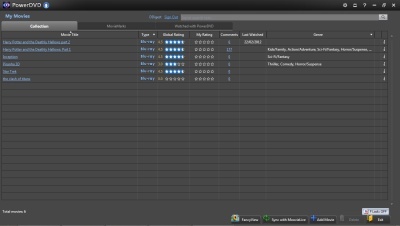 It's easy to use, allows you to enter in the YouTube meta information such as title, tags, description and it works. It's something you previously had to pay extra to get the function through Cyberlink's other movie editing tools, but it's now included in all version of PowerDVD. Facebook integration allows you to post comments and status updates, about your movie viewing, to your Facebook page. Facebook video uploads are also supported, which works similar to the way YouTube uploads work. 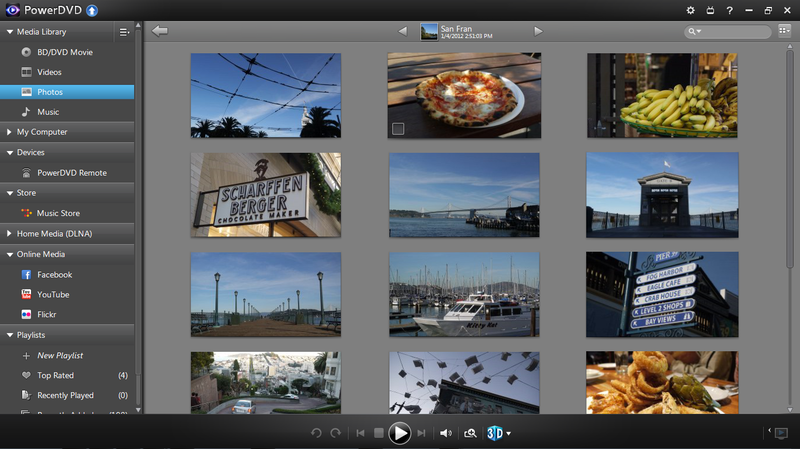 Flickr support is also included for photo sharing. New to PowerDVD 12 is support for music purchases from 7Digital. As I'm not in the US, I cannot access and test this feature. 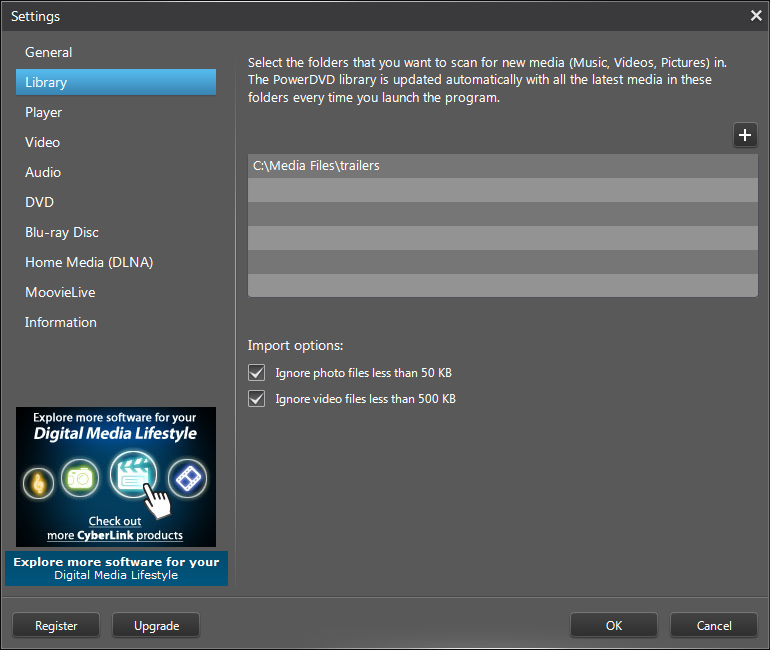 Most of the improvements in PowerDVD 12 comes in the area of media management and sharing. When you first start PowerDVD 12, you're asked to specify media folders to add to PowerDVD's media library. Once these folders are set up, PowerDVD will scan then every time at start-up, and refresh their content. 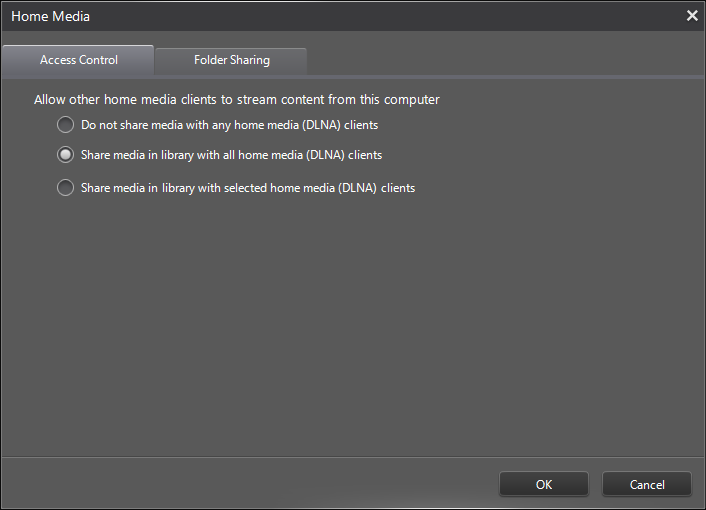 The media added to the PowerDVD library can then be smart-synced with your smart device (more on that later), or you can use PowerDVD's new ability to act as a DLNA media server, to share the media files with your other DLNA compatible devices. This means that you can use PowerDVD 12 in the same way as you would use well known DLNA clients such as TVersity, PS3 Media Server. But unlike those dedicated solutions, you're better off ensuring the media files shared would already be fully compatible with your playback device, as real-time transcoding isn't an option here. 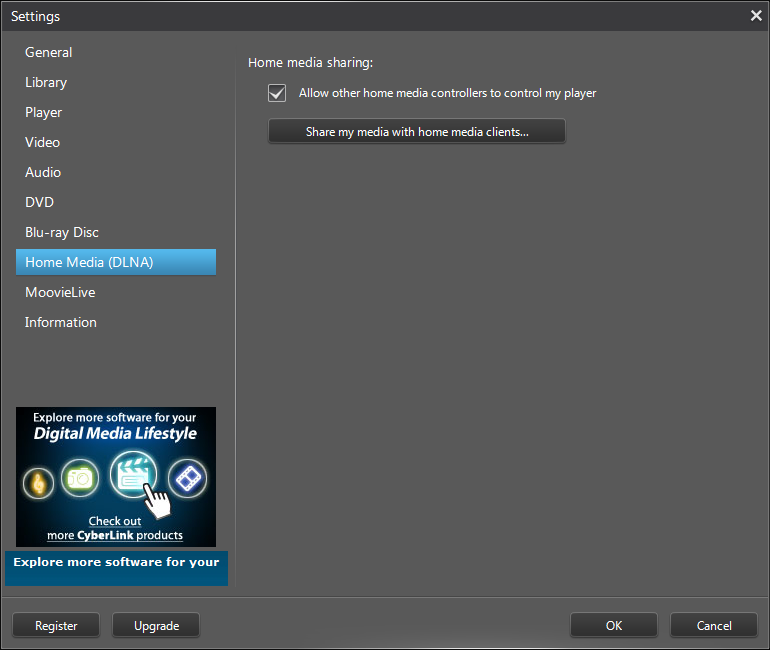 PowerDVD 12 can also act as your DLNA Digital Media Controller, with the option to "play to" your compatible DLNA devices. I had some trouble getting this feature to work, but it works best going the other way around, for example, using the PowerDVD Mobile app to "play" a photo slideshow to your PowerDVD PC. 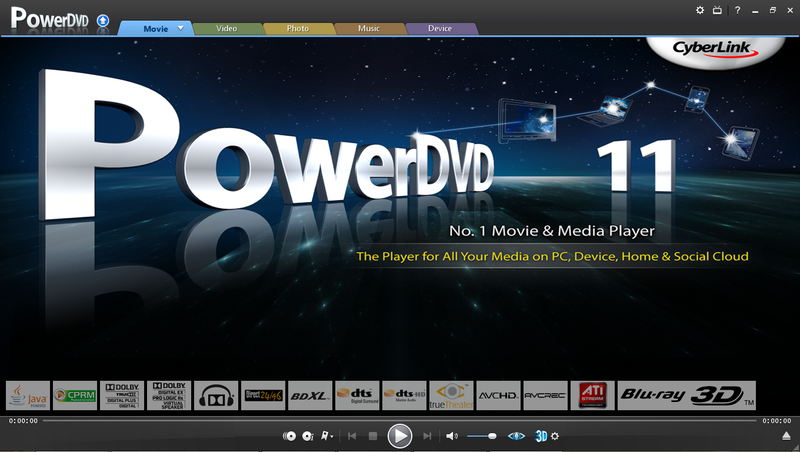 Overall, the PowerDVD interface is fairly intuitive for media management. The automatic thumbnail generation works as promised, and you can easily adjust the thumbnail size using the "instant scale" feature via the same controls on the main control panel as "instant zoom". 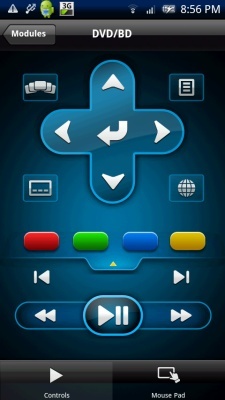 PowerDVD (Pro and Ultra) has extensive support for smart devices such as smart phones and tablets. 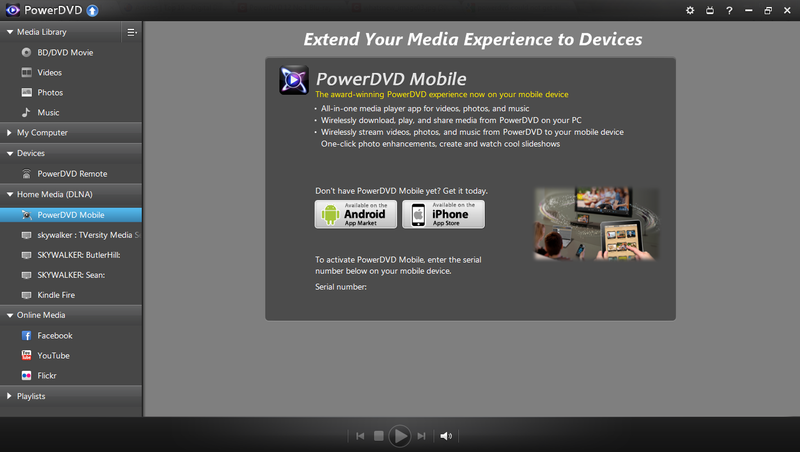 PowerDVD Mobile is now fully integrated into PowerDVD. 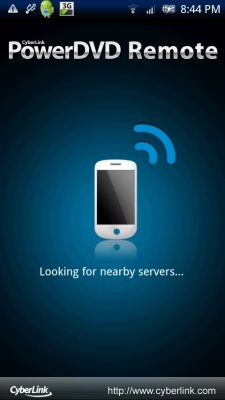 PowerDVD Mobile is Cyberlink's mobile app (for iOS and Android), it basically act as the DLNA client to connect to PowerDVD, as well as a basic music/movie/photo viewer for your smart device. As mentioned earlier, one of the more useful features is the "play to" feature, allowing you to "order" PowerDVD to play compatible video/music/photos stored on your smart device from the smart device. 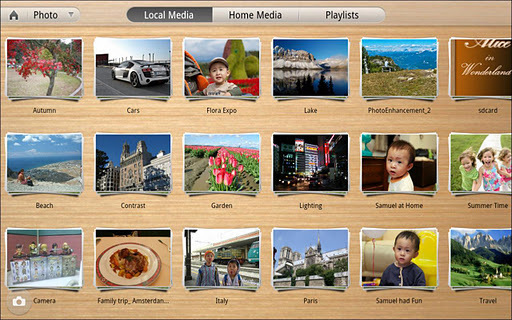 For example, you can select a bunch of photos and use the "play to" feature to point to the computer that has PowerDVD installed (it doesn't have to be running), and a slideshow will start for those pictures automatically. 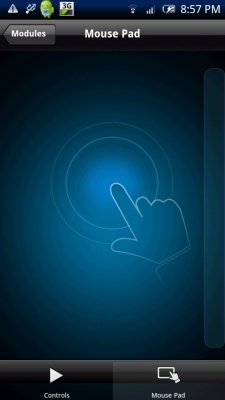 You can even control the progress of the slideshow right from your smart device. PowerDVD Remote still works similarly to the way it did in PowerDVD 11, basically turning your smart touch device into a giant (or small) remote control for PowerDVD. 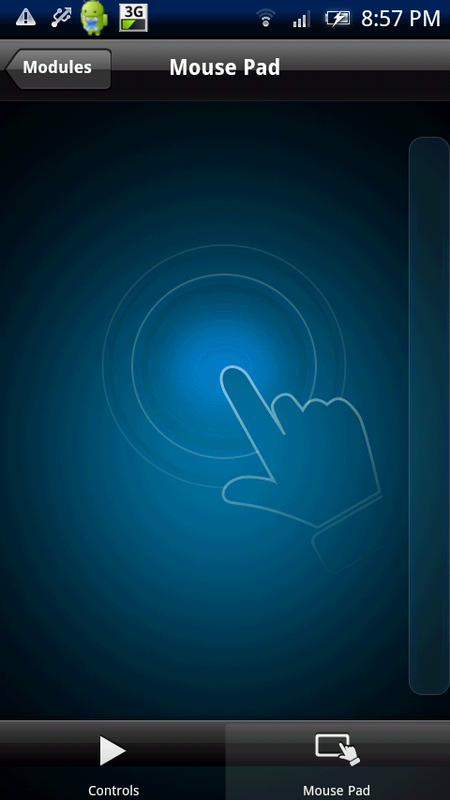 Best of all, it can allow your device to be a make-shift touchpad, that controls the Windows mouse, not only in PowerDVD, but also in other apps too. 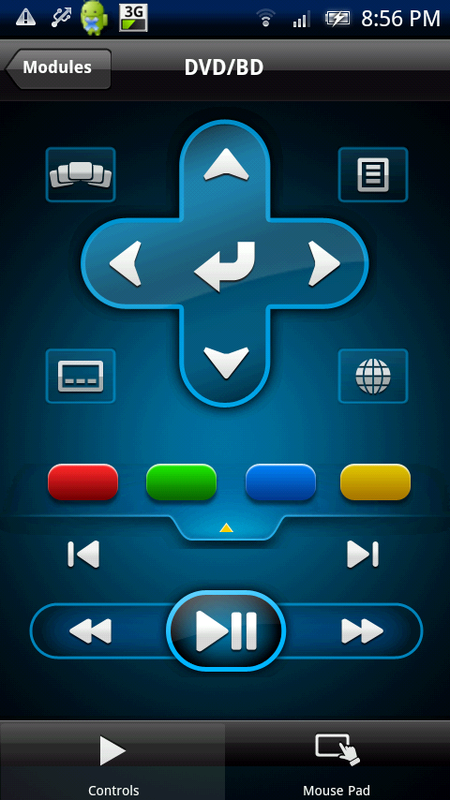 Installing either Mobile or the Remote app is easy, with the need to input a serial/code that activates/connects the app with the main PowerDVD software. 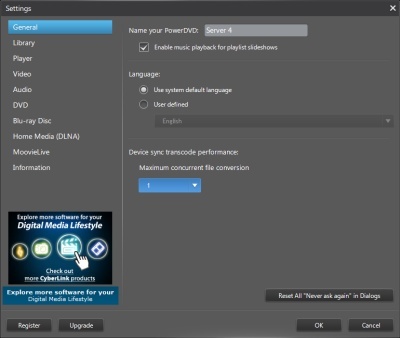 New in PowerDVD is Smart Sync, which allows you to quickly sync the media files between your smart device and your PowerDVD library, both ways. 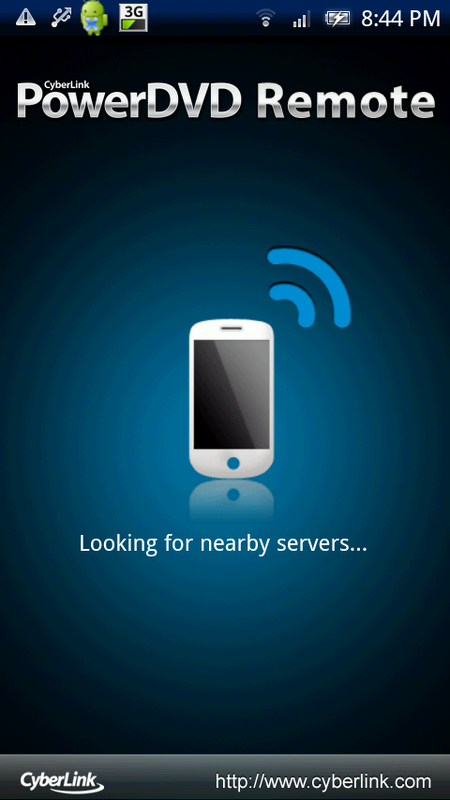 Devices need to be connected via USB for the sync option to show up. An interesting feature is that PowerDVD can be made to automatically transcode the video to a format supported by your mobile device before syncing. These functions largely remain unchanged, so the text below mostly come from the PowerDVD 11 review. 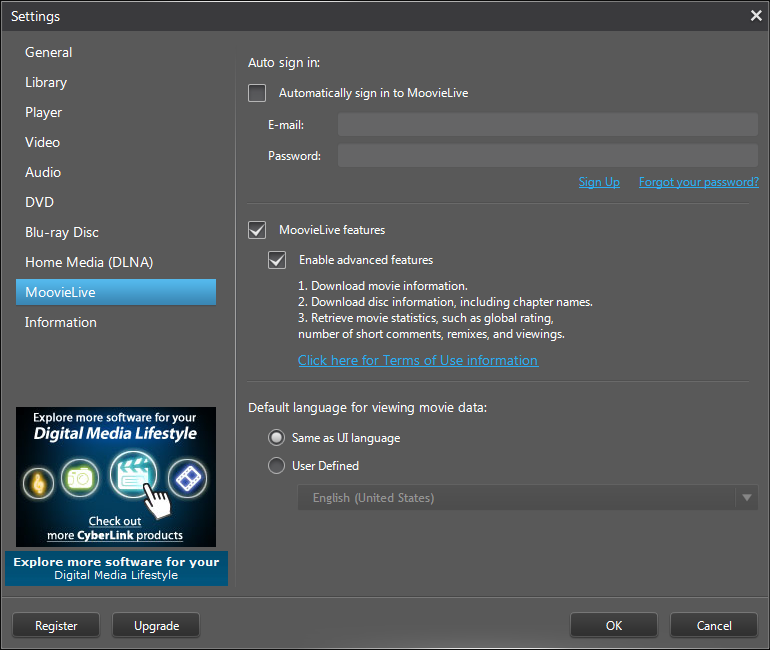 PowerDVD has a "Cinema Mode" which is designed to fit into the general aesthetics of Windows Media Center, and designed to work better on large screen devices (and more easily controlled when coupled with a smart device running PowerDVD Remote). Cinema mode also has a "Stereo view", which makes the minimized, home cinema optimized version of the PowerDVD interface appear in 3D. While nothing has really changed in this area between PowerDVD 11 and 12, but it remains as useful as always for those driving their HTPC using WMC. With playback tabs introduced in PowerDVD 10, and enhanced in 11, it has been removed entirely in PowerDVD 12, instead, the "tabs" are now integrated into the left hand side navigational tree. It makes for a much more streamlined interface, and increases the viewing area to boot. Overall, there are no real usability issues with the interface, although it did appear to be slightly sluggish from time to time, but not so much that it comes unusable. Again, stability seems to have improved, with no Blu-ray errors or crashes during testing, even though I was starting and stopping the player, and trying out all the functions all throughout. Most of PowerDVD 12 improvements are rather incremental, rather than revolutionary. 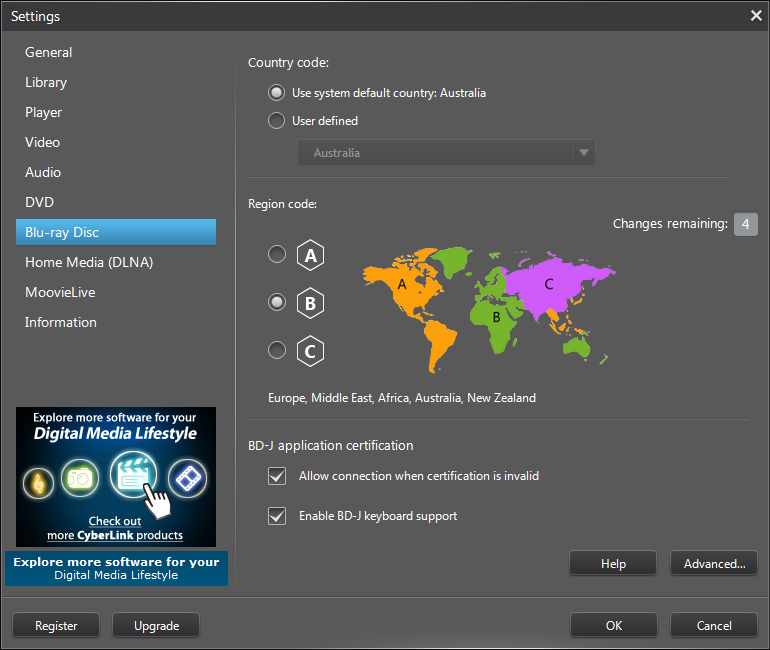 The focus this time seems to have been to turn PowerDVD into the centerpiece of your digital media hub, and there are certainly some very useful new inclusions, such as the ability to use PowerDVD as your DLNA server, and media renderer. 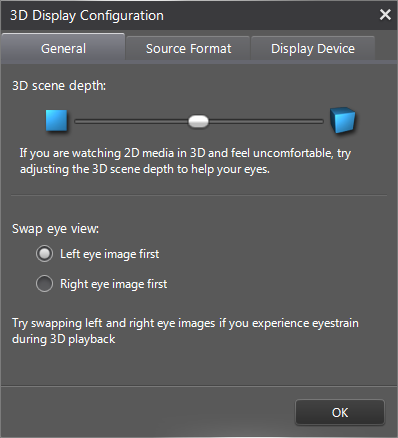 3D wise, the inclusion of 3D upscaling for Blu-ray movies is helpful for those that don't have access to a TV with a similar function, and instantly boosts your 3D Blu-ray collection, even if it's done artificially. And with little improvement left to make for Blu-ray playback, the addition of DTS-HD 7.1 support will be welcomed by those using PowerDVD (as opposed to a dedicated amp/receiver) as their audio decoder. And the continued improvement to mobile/smart device support keeps PowerDVD fresh and relevant in the age of smart phones and tablets, and gives the Ultra version extra value by including the mobile apps as part of the package for free. And with other changes, such as improved YouTube integration, 7digital music store support, and basic video transcoding support, PowerDVD 12 is clearly the best version of PowerDVD yet. 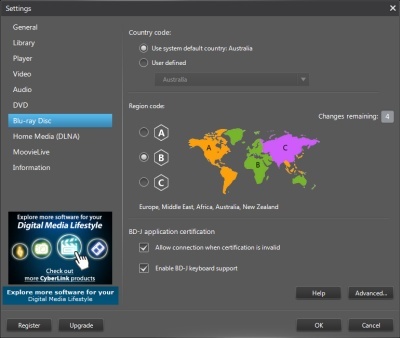 Whether it makes it worth the price of the upgrade, depends on each user, but if you want to make PowerDVD the hub in which your smart devices, home media server all resolves around, then there are plenty of new features in this area to tempt you into an upgrade. The review version of PowerDVD 12 Ultra was provided by Cyberlink. For archives of all previous PowerDVD version reviews, please refer to the PowerDVD Review Archive.